In the previous tutorial, we have learned 9 implicit objects in JSP. In this tutorial, we will learn about JSP Directives with Example. Basically, there are 3 types of JSP Directives, Page directive, include directive, and taglib directive. We will learn these directives in detail. 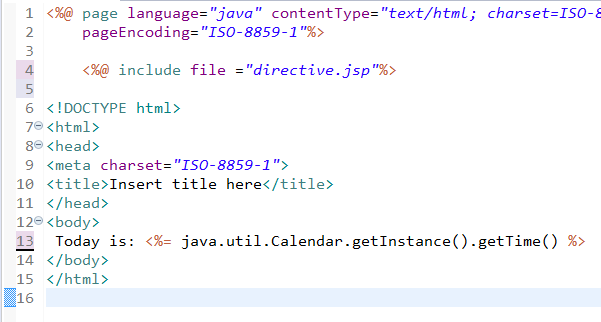 But first, understand what is JSP Directives? We can use the following three Directives. 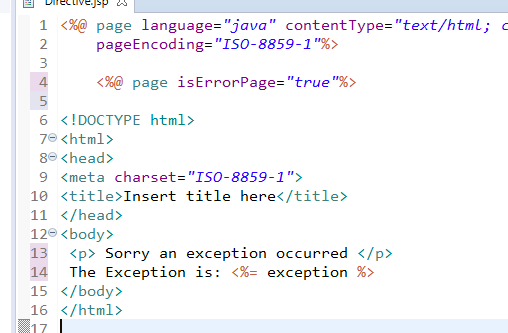 To define the attribute for the JSP Page, the page directive provides a mechanism. Page directive is used to set the content type of the page as well as the language that will be used for scripting. There are 11 attributes of JSP Page Directives these are discussed in detail below. It defines the scripting languages to be used in scriptlets, expression, and declarations. 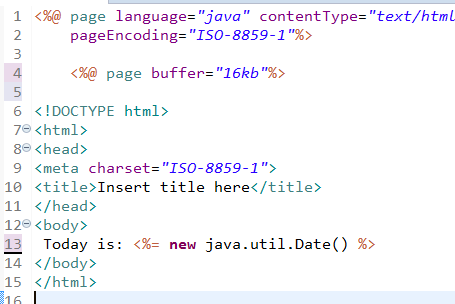 It defines the character encoding for the JSP Page.if any other no specified, The default value is ISO-8859-1. 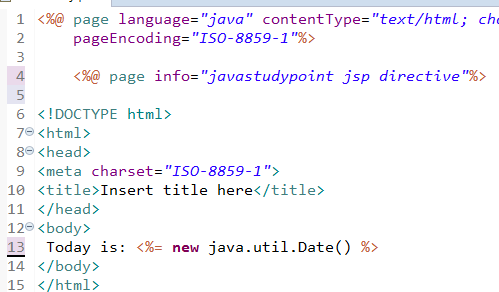 It indicates if this JSP Page is intended to be the URL Target of another JSP Page errorPage. if set to true, then the implicit script language variable exception is available and references the Throwable object from the offending JSP page. If this value is false, then the exception variable isn't available and will cause a translation error if it is referenced. It tells the container whether the page is thread-safe with proper synchronization implemented on the page. A value of true indicates that the container may send multiple requests to the page. if the value is false, requests will be queued and sent one at a time. It has the same meaning as the import statement in java classes. It is used to set an informational String that's incorporated into the page and accessible by using Servlet.getServletInfo() method. It provides a mechanism to define a fully qualified class name of the superclass that the container will extend to generate the translated page. It defines the character encoding for the JSP Page and the Multipurpose Internet Mail Extension(MIME) types for the response of the JSP page. It specifies the buffering model for writing content to the output stream. The value of none indicates to write directly through to the ServletResponse using its PrintWriter.While specifying a buffer size, it must be in kilobytes(kb). It specifies that the buffered output is flushed or not and the default value of "autoFlush" attribute is true. When set to true, the output buffer is automatically flushed when the buffer is full. when set to false, this will raise an exception when the buffer is full. Read: What is Exception in Java? 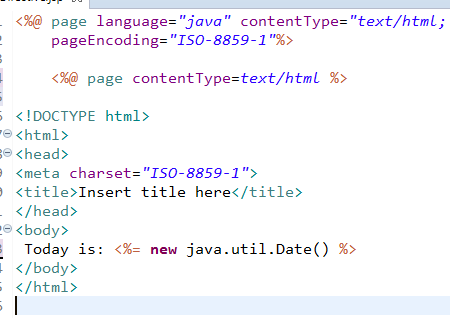 The include directive tells the container to substitute the defined resource content inline to the JSP page. This can either be template text or code. In the include directive, the resources specified must be a relative URL, that's accessible by the container. 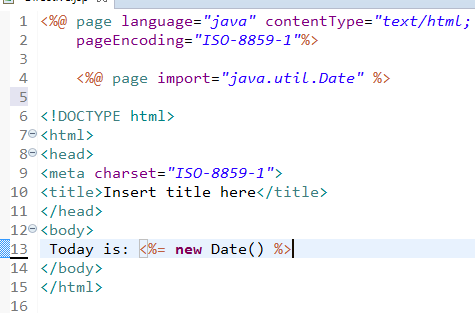 if the include files changes, then it doesn't necessarily trigger a recompilation of the JSP file.if an include file changes, then the JSP 2.1 specification recompilation hasn't required.